[ABRAHAM LINCOLN]. Book. Political Debates Between Hon. Abraham Lincoln and Hon. Stephen A. Douglas, in the Celebrated Campaign of 1858, in Illinois. Columbus, Ohio: Follett, Foster, and Co., 1860. 3rd edition, with publisher’s advertisements bound in. 268 pp., 6½ x 9½ in. Lincoln’s debates with incumbent Illinois Senator Stephen Douglas earned him national prominence. Slavery was the pressing national issue, especially regarding its expansion into the western territories. Douglas authored the Kansas-Nebraska Act (1854), which effectively repealed the free-slave dividing line set by the Missouri Compromise (1820) at 36° 30’ north latitude. Instead of banning slavery north of the line and banning south of it, new states would instead decide on slavery’s status within their borders by “popular sovereignty.” On its surface, Douglas’s bill appeared to offer the nation a middle path on the contentious issue of slavery. Instead, it would only muddy the waters on slavery. The Kansas-Nebraska Act was only one of a long list of compromises in the middle decades of the nineteenth century. Despite these attempts, the slavery debate only became more heated throughout the 1850s. Northerners, seeing the hypocrisy of “states rights” advocates, chafed when a new Fugitive Slave Act (1850) required the use of federal marshals to return escaped slaves. An unintended consequence of Douglas’s bill resulted in fraudulent elections and violence in Kansas in 1855 and 1856. South Carolina Representative Preston Brooks bludgeoned Massachusetts anti-slavery Senator Charles Sumner on the Senate floor after an 1856 speech. In 1857, the Supreme Court handed down the Dred Scott decision, which decreed that African Americans could not be citizens and, based on one’s right to bring property across state lines, effectively erased the division between free and slave states. Slavery, unspoken but protected in the Constitution and mitigated by antebellum compromisers, was a tinderbox about to roar to fire. Lincoln recognized the problems slavery presented for the nation, and in his debates with Douglas, focused his attention on the nationalization of slavery, both West and North. 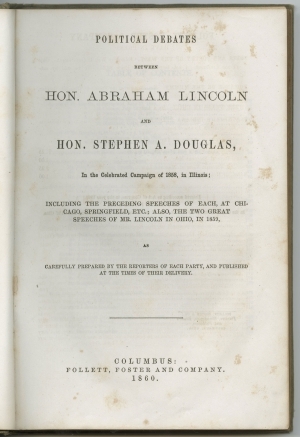 After he was nominated as the Republican candidate for the Senate, he spoke to the convention, famously asserting that “a house divided against itself cannot stand.” The House Divided speech, delivered at Springfield, Illinois, on June 17, 1858, is the opening piece of this book. Though he would lose the Senate race, the rest of the book details Lincoln’s intellectual combat with Douglas over slavery. This book is a third edition, identified by the line over publisher’s imprint on the back of the title page, the numeral “2” at bottom of page 13, and publisher’s advertisements bound in at head. Harrison Yerkes (1841-1899) enlisted as soon as the Civil War erupted, but since he was under 21 years of age in 1861, his father removed him from service. As soon as he reached the age of majority, he enlisted in the 31st Michigan Infantry Company, and remained in the Army for the remained of the war. He returned to Michigan, purchased two tracts of land, which he farmed until retiring in 1891. He was a lifelong Republican, though never held office. Light green boards faded, blind stamped, gilt lettering on spine, “Harrison Yerkes Northville, Mich 1860” erased from free front endpaper, same present (minus date) on verso of ffep, bep, and back paste down. Very minor scattered foxing. Publishers advertisements bound into headmatter Minor shelf wear. Tight. Paul Leake, History of Detroit, Volume II (Chicago: Lewis, 1912) pp. 765.